This is your homework and it is compulsory to submit your work via the Maths blog. To demonstrate your understanding of concepts through clear articulation on your approach to solve the problem. This is an Individual Task. You are to complete the viva voce practice on your own. It will also help you to seek and articulate your understanding of concepts as you attempt to explain your approach and solution to each problem. 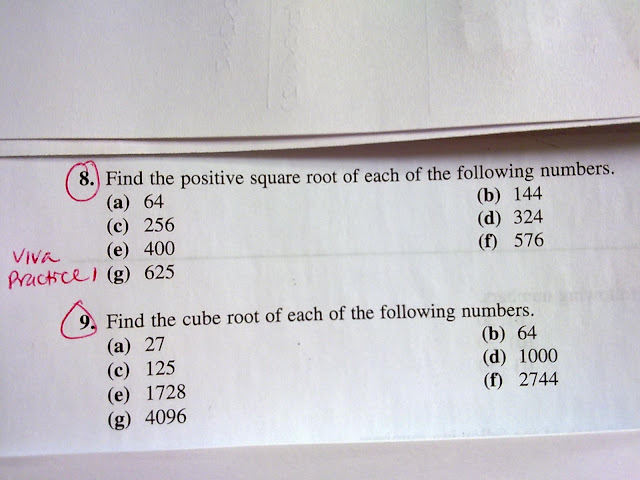 You will explain how you find the positive SQUARE ROOT/CUBE ROOT of the following numbers. Your explanation should be concise, relevant and clear. The video clip should not be longer 5 min. You may choose any suitable multimedia application for this task (e.g. PhotoBooth, QuickTime Player). Keep the file size of the video clip small as you are expected to upload it to the internet (Blog, YouTube, Facebook). Refer to the "Discovering Mathematics" Workbok (page 2) for the actual question. The video clip may be uploaded directly to the blog. Alternatively, you could also upload the video clip to Facebook (set it to public view) or YouTube before embedding it in the blog post. It is your responsibility to ensure that the voice of the video clip is audible as verbal explanation is key to such task. Note: Send an email to Ms Loh if you have not been invited as a co-author of the blog yet.